Futurama Back on TV in June | Critical End! 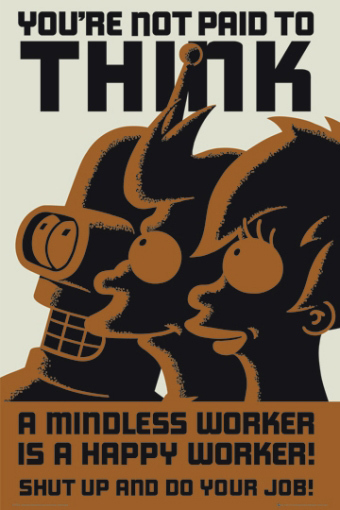 I, like all right-thinking people, love Futurama. It’s up there with Mystery Science Theater 3000 as one of the best shows to ever grace the air waves. So when they recently got the band back together for four direct to DVD movies, I was pretty psyched. The movies weren’t very good. I know! I shouldn’t look a “gift space cow” in the mouth, but the movies were far inferior to any episode of the show. I think it was partly due to the difficulties inherent in adapting a TV show into a movie, and partly due to the fact that each movie only had one or two writers, as opposed to the entire writer’s room worth of ideas the series had. Either way, the DVDs were a success and the show is returning with new episodes on Comedy Central this June! I’m a little wary, but very excited to see it return to the more familiar format. And while this teaser isn’t particularly funny (same joke they did in the first comeback movie), you should still watch it and get your expectations unreasonably high with me! Bored to Death? More like BORED to Death! This entry was posted on Friday, March 19th, 2010 at 9:40 amand is filed under . You can follow any responses to this entry through the RSS 2.0 feed. Both comments and pings are currently closed. even bad Futurama episodes are better than silly Family Guy and American Dad. So glad its coming back! Couldn’t agree more, Tim. I used to like Family Guy but it’s sucked ever since it came back from cancellation.